This conversation is sponsored by the National Milk Life Campaign’s Back-to-School program but all opinions are my own. Our morning usually starts with the chirping of three little boys asking for cereal somewhere around 6 A.M.. Shortly before 7, big brother and sister are up and having their breakfast too, and then they are off to school for the day. Some days the rest is a blur. It seems like these three sweet little boys do nothing but eat a lot of days…snacks of fresh fruit, veggies, cheese, applesauce and sandwiches and more veggies and fruit for lunch. Brother and sister come home from school and it’s time for after school snack then dinner shortly after. Some nights, depending on how early dinner was, there’s an evening snack too. The kids are very active and very busy so I know these meals and snacks are fueling them through their days. In mid-September, we joined the Milk Life Back-to-School campaign, a program designed to educate moms and others who care for kids about the powerful nutritional benefits of milk. Last month, we shared tips that you might not know about milk and today I’m sharing with you a typical day of meals and snacks and how we prioritize nutrition. Like I said, mornings start early with the little boys asking for cereal. That’s usually what wakes us up long before the alarm goes off. We have a son with Celiac Disease so cereal is typically whole grain and unsweetened with whole milk. They don’t really know it any other way. One of their favorite things to do is drink the left over milk from their bowl. The big kids usually have the same for breakfast but they are heading off to a busy day of school, so I like them to have a full serving of milk at breakfast. A full serving except for what little brother might talk his sister out of. Getting protein at breakfast helps kids feel full and satisfied and having it the morning helps maximize how their bodies use the protein throughout the day. With milk in their diet, I know they are getting protein to help them get through the day. After the big kids are off to school, the little boys play and do “homework”. Mid morning they are ready for a snack which is usually a combination of fresh fruits, fresh veggies, and cheese. Sometimes snack is applesauce and whole grain crackers. 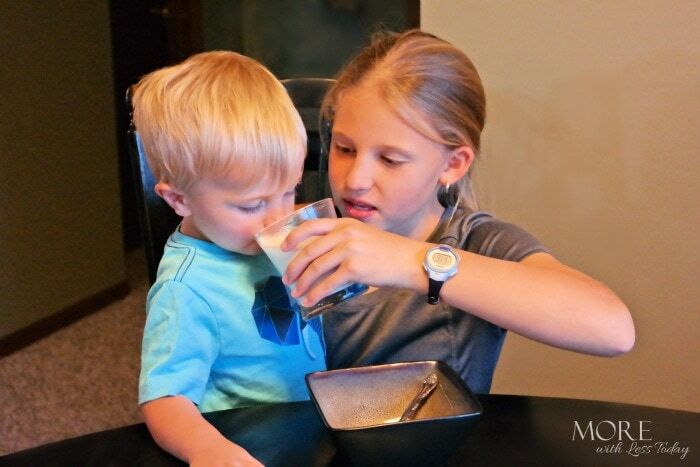 No matter the snack, the littles ALWAYS have a serving of milk with their snack. I know they drink the milk from their cereal, but that isn’t a full serving. In just one 8 ounce glass of milk, they’re getting protein, B Vitamins, Vitamin A, Calcium, Vitamin D, and Potassium. All are important nutrients they get for a healthy diet by including milk. Even though they have a mid morning snack, these active boys are hungry and ready for lunch by noon, sometimes earlier. Lunch is usually a sandwich on whole grain bread (or gluten free bread for our 2 year old) with fresh veggies and fruit. The big kids take the same thing in their packed lunch to school. The three little boys go down for a nap after lunch and are usually waking up about the time big brother and sister arrive home from school. When the big kids come home from school, it’s after school snack time for everyone. Again, snack is fruit and veggies. I guess we eat a lot of these in our house. After they’ve had snack they play outside or inside until it’s time to do homework. 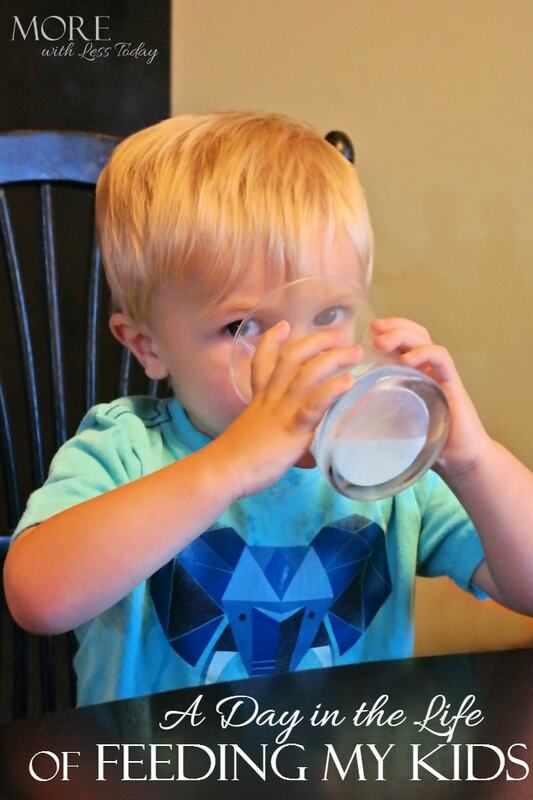 Dietary guidelines recommend children over 8 should consume three servings of milk each day. The American Academy of Pediatrics suggests that growing adolescents may need as much as four servings a day. 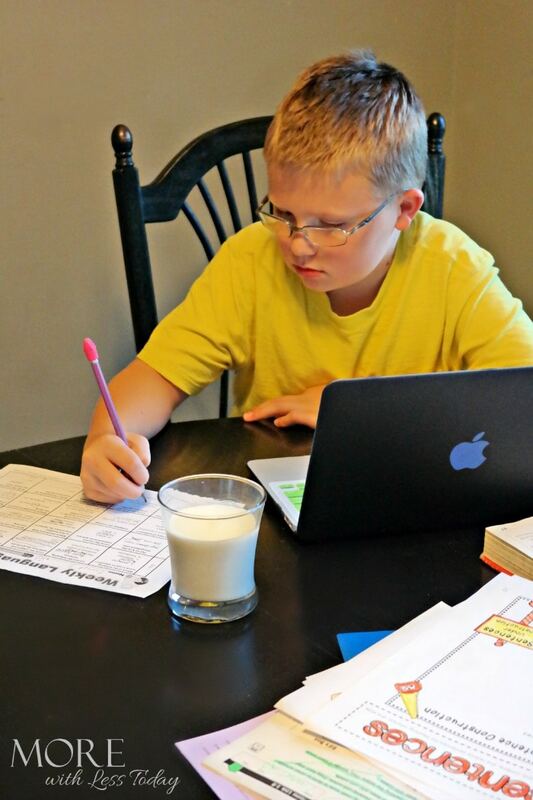 The big kids don’t always like to drink milk with meals so they usually have a glass while doing their homework. After homework, it is dinner and then family time, or a kids sporting event. Sometimes before bed, everyone will have a light snack but again that depends on if dinner was early due to commitments. As I’ve mentioned, we have a 2 year old with Celiac Disease which means we’re really careful about what goes into our foods and drinks. I’m allergic to corn so that makes things even more difficult. With real milk we don’t have to worry though because real milk is just simple ingredients – milk, Vitamin D, and Vitamin A. Milk is also minimally processed and often locally delivered with the pasteurization process simple. Whether it’s regular or organic, flavored or white, all varieties of real milk are safe, wholesome, and naturally nutrient rich. Visit MilkLife.com for more content and recipes and follow Milk Life on Facebook , Twitter Pinterest and Instagram. Two readers who comment will each win a gift card worth a free month’s supply of milk (valued at $18 per month). Now that you know about “A Day in the Life of Feeding My Kids”, we would love to hear about your day too! I love milk! I drink it with almost every meal. My kiddo not so much. We give him a lot of cheese and yogurt! My son has ALWAYS loved milk. I even had to cut him down from drinking too much when he was a toddler/preschool age. He’s in middle school now and still drinks at least 3 glasses (usually more) a day. He also has it on cereal several mornings a week, but I don’t have to trick him or sneak milk in, he just wants a glass to go with his meal or snacks. Milk is definitely a MUST in our morning meal! Thankfully, my boys love it and get plenty of servings per day. My kids totally love milk especially in the morning before school. I kind of love it too especially with hot cocoa. Milk goes so quick in our home. My kids love milk and drink it up all day long. We are fixing to have a new baby in a week or two, so I know milk will really become a huge part of our lives for years to come! I love to drink it for breakfast or a mid-day snack! What a generous giveaway! A month’s worth of milk can really make a difference for a family! I incorporate milk as a drink with breakfast, with cookies (and other sweet snacks), and making protein drinks/smoothies as snacks.